William Lambers is an author who partnered with the UN World Food Programme on the book Ending World Hunger. His writings have been published by the Huffington Post, New York Times, Cleveland Plain Dealer, Cincinnati Enquirer, the Hill and many other media outlets. Imagine a mystery guest coming to your Thanksgiving dinner, one you have never met. Imagine this "silent guest" being a starving person from a war-torn or impoverished country. That is what students at Mount St. Joseph University in Ohio want you to think about this Thanksgiving. Students of the Mount's Impact Club (Monica Brucher, Andi Saylor, Courtney Reed and Brittany Hein) are urging everyone to feed a "silent guest" at this year's Thanksgiving. These students have been holding fundraisers for the World Food Programme (WFP) and trying to get people to join their "silent guest" plan. Where did they develop this idea: From history! After World War II, thousands of American households took in "silent guests" at Thanksgiving. 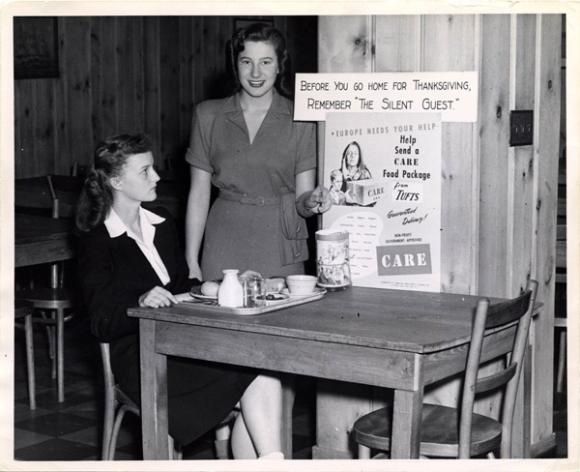 The "silent guest" campaign of 1947-48 asked Americans to open up their hearts and share their Thanksgiving bounty. Governor Robert Bradford of Massachusetts, a descendant of the Pilgrims who started Thanksgiving, proclaimed the new tradition of feeding a "silent guest" at the holiday meal. American families were asked to donate the cost of feeding their "silent guest" to a committee in Plymouth, Massachusetts. Checks poured in by mail. One was even made out to William Bradford, who was the governor of Plymouth colony for the first Thanksgiving. The "silent guest" donations from Americans led to CARE packages of food being sent to starving families overseas. This was crucial for many countries in Europe, who were still reeling from the destruction caused by World War II. Drought had struck in the summer of 1947, causing severe food shortages. The food from the "silent guest" helped keep Europe afloat until the U.S. backed Marshall Plan to rebuild could kick in. As Secretary of State George Marshall said, "food is the very basis of all reconstruction." The "silent guest" idea was started by an activist named Iris Gabriel. She approached Governor Bradford – Robert Bradford, the 20th century governor -- with the plan and eventually governors across the U.S. were on board. It was "giving thanks by giving." It's a spirit we must keep with us today. Fighting world hunger is no less important than it was in 1947. The WFP and other relief agencies are facing an incredible challenge with hunger emergencies. There are hungry refugees from the wars in Syria, Yemen, Iraq, South Sudan, Central African Republic and nations affected by the Boko Haram conflict. Catholic Relief Services says that in Madagascar over one million people need food aid because of severe drought. Some have resorted to eating cactus to survive. In Haiti, the impact of Hurricane Matthew will be felt for months to come. Agriculture was severely damaged and the WFP is trying to help farmers and feed children school meals. The biggest humanitarian disaster in the world is the war in Syria. The WFP is trying to feed over 7 million Syrians each month. That is more than the entire population of Massachusetts. In Iraq, those suffering under ISIS occupation also suffer from hunger. Mohammed, who lived in a town taken by the terrorist group said, "We lived without food, water and electricity for so long. At one time, I remember a can of baby milk cost $40 and no one could afford to buy it. It felt like they wanted us to return to a life in the Stone Age where we survived solely on bread, dates and water. One of my relatives managed to smuggle food in from the desert just so we were able to eat — but he risked his life to bring it. Life was a living hell." Mohammed managed to escape and now works for the World Food Programme, helping feed victims of the war. Iraqis liberated from ISIS rule must also be liberated from hunger. Indeed war, drought and other disasters always lead to hunger. The "silent guest" plan to feed the hungry is desperately needed today as it was after World War II. That is why it's inspiring that college students are leading the campaign to revive the "silent guest." And you can join them by simply setting aside a place in your heart and your holiday table while donating to a charity fighting hunger. Give thanks by giving. By doing so you can take the greatest step toward world peace. Happy Thanksgiving!